Fifth, I start every conversation with a smile. When I greet someone, I smile to warmly say hello before starting a conversation. Smiling helps me to mentally feel more positive and happier, and it is always returned by my other conversation partner. Doing Gratitude Journaling, saying affirmations, thinking of a recent success, dressing up to feel my best and smiling are daily parts of my self-love ritual and routine that help me to always put my best self forward in every interaction with others. As a part of my series about “Connecting With Yourself To Live With Better Relationships” I had the pleasure to interview Devoreaux Walton. Devoreaux is an author and confidence coach who serves as the CEO and Founder at The Modern Lady, a lifestyle company that educates and empowers women to live their best lives. Walton and her team teach women worldwide how to elevate their lives with elegance — helping them to unlock and unleash their feminine power through coaching, courses and community. Walton knows the power of mindset, wardrobe and charisma, and teaches timeless life principles for women to upgrade the essence of their chic selves to truly thrive. 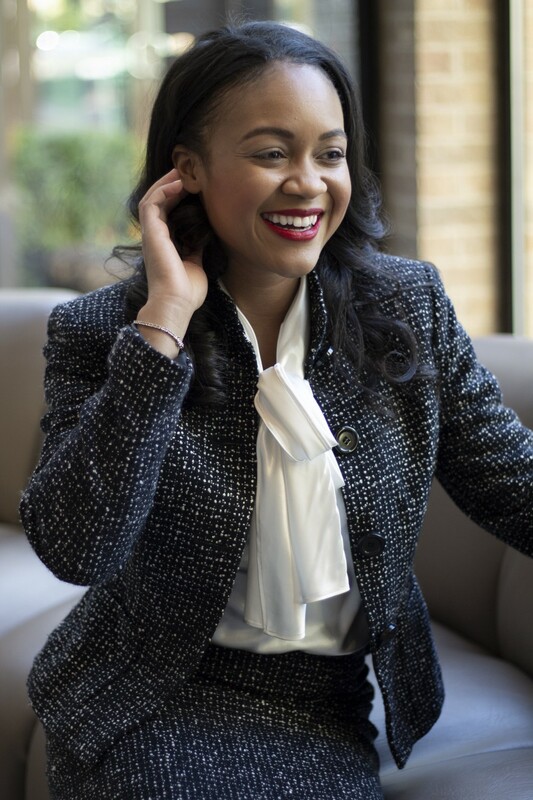 A Spelman College graduate with a Bachelor’s degree in Psychology and a Washington University in St. Louis graduate with a Master’s degree in Business Administration, Walton is candid about sharing lessons learned from her corporate career at Google and IBM to inform and inspire her clients. A southern belle from Atlanta, Georgia, Walton currently resides in Dallas, Texas, with her Maltipoo daughter, Nyla. I spent many years unhappy with my life. I was frustrated with my career, working a job without a path forward that I was truly excited about. I was frustrated with my wardrobe, not presenting myself with a stylish appearance that I wanted to have. I was frustrated with my social life, being shy and introverted I was uncomfortable speaking with new people and wanted to expand my network and social circle but didn’t know how. I hit a breaking point, and one day I realized that I was tired of wanting to be a different woman with a different life and having a huge disconnect between who I actually was and who I wanted to be. I decided to make a change. I invested in myself. I worked with coaches and personal trainers, I read books, I studied women I admired that seemed to have it “all together” and I learned how to be intentional in my life to deliberately choose who I was and how I showed up. After applying what I learned I was able to give my entire life a makeover. That was five years ago. I was inspired by the positive change and transformation in my life to teach and show other women how they could do it to, step into their feminine power to be the best version of themselves and live their best lives. The Modern Lady is a lifestyle company that teaches women to increase their confidence, with class and charisma. I love what I do because inspiring and empowering women is so impactful — once a woman feels her best, she is her best self, and she unlocks a thriving, happy and successful life! The most exciting project I have right now is my latest book, Je Ne Sais Quoi, which was launched March 1, 2019. Je Ne Sais Quoi is a transformational book for women to embark on the journey of self-discovery in order to fully embrace self-love so they can flourish personally and professionally. I wrote this book for women to focus on making themselves a priority, which often can be difficult to do with a busy life, demanding career and family to manage. I want women to know the value of living in self-love, and my book teaches them step-by-step how to effectively accomplish that. After reading Je Ne Sais Quoi, you will stand taller, smile brighter, and live in full confidence and authenticity with who you are — all while carrying yourself with elegance, style and sophistication. Before I gave my life a makeover and had my transformation, I was living in fear and self-doubt. I wanted to pursue job opportunities but didn’t think I was qualified. I wanted to move to a new city but was afraid of going somewhere without family. The tipping point for me occurred after having a phone conversation with my best friend. I had been griping and complaining for years about the same things, and she asked me ‘When are you going to do something different?’. That question was all it took for me. That was my wake-up call. I was headed home in traffic and after getting off the phone with her, was sitting in the car with nothing but my thoughts. That evening, I arrived home and was ready to take action. I wrote down everything in my life that I didn’t like, everything that didn’t serve me, and everything I wanted to change. That was my first step. The next day, I picked one thing, just one area, and decided to start with that. The first area I focused on changing was my mindset. The fear and self-doubt I lived with every day was stemming from the thoughts and ideas I told myself. I decided that if I could master my mindset, all the other changes I wanted to make would be easier. My best guess was spot on. Once I worked on my thoughts, feelings and self-talk, I started living each day with self-acceptable and self-love. Everything else shifted because of how I felt. My conversations with people shifted. My posture shifted. Every area of my life improved once I learned how to love myself. It was the first start to stepping into my feminine power. This is why when I coach and work with clients, mindset is the first area that I cover. It is the foundation of everything else. Self-love is essential to thriving in life. Once you have self-love, everything else will be elevated, and fall into place. In today’s society, the media and online networking are a large source of influence on self-image. Women and men look at movies, television shows, magazines and social media — and compare themselves to what they see. It is very dangerous to look at all these other people, advertisements, photoshopped images, airbrushed photos and visuals with multiple filters, then stand in the mirror and pick yourself apart because of what you see in your reflection. When your self-image is negative, you are affected emotionally and mentally. A negative self-image can lead to feeling like an impostor, like you aren’t qualified, like you don’t belong, like you can’t or shouldn’t do something. The real consequence is that you miss out on opportunities that you otherwise could have had. You miss out on jobs when you don’t apply. You miss out on a great relationship when you don’t approach someone new. You miss out on job raises or promotions when you don’t step up and take on more responsibility. The consequence of a negative self-image is truly “settling” for a life that you don’t want because you allow your thoughts and feelings to hold you back from maximizing your potential. A positive self-image is crucially important for success, and strongly affects your personal and professional success. Loving yourself is important because life is full of challenges, ups and downs, highs and lows. When you are faced with a difficult situation, self-love can ease the burden of dealing with adversity. Self-love and confidence make overcoming challenges easier because you rely on your strengths, skills and talents to problem solve and navigate difficult situations. Loving yourself also makes you happier. When you feel good about who you are, you enjoy each day with positivity and optimism. A cheerful attitude can help you make the best of any situation you are faced with, and life is much more enjoyable when you feel good about yourself and the people and circumstances around you. A third benefit of loving yourself is that you have the motivation from within to confidently pursue your goals and dreams. When you create a goal for yourself, you can fervently work toward achieving it, when you have self-love. Your time, energy, attention and focus are on taking the action that you need to in order to pursue the opportunities in front of you, when you love yourself, instead of focusing on what can’t or won’t work out because of fear, your weaknesses or any uncertainty you may have. I once read a wonderful book called Good to Great by Jim Collins. The book is about business, but it has significant wisdom that can be applied to your personal life as well. In any situation, relationships, career, health, fitness or wardrobe, it can be easy to “settle” for what is good. Why bother giving more effort, money, time or attention to improve something when ‘good’ is enough? This certainly can explain why it’s easy to stay in a mediocre relationship. Someone who is ‘nice’ and happens to be around is an easy choice to select, so that you can have someone instead of being alone. Being great is hard. It takes work and sacrifice. It takes giving up an available option to want and be committed to having more, to having passion and fire and chemistry. The truth is, greatness is hard to come by. Greatness, the successful, off-the-charts, exciting option in any category — relationships, career, health, fitness or wardrobe, takes you being open to giving more resources of your time, attention, energy and money, to make it happen. For any reader in a mediocre situation or relationship right now, I’d encourage you to first give yourself grace as you start to realize the mediocrity. Don’t beat yourself up, don’t chastise yourself. Just take inventory. As you realize that a relationship is mediocre, you have a decision. You can either take action or allow things to remain unchanged. If you want to take action, you can do one of two things — either decide what you need to change within yourself and how you approach the relationship or speak directly to the person in the relationship and work with them to make changes together. You always have a choice. You can stay in a mediocre relationship or you can take action to make a change. Relationships always take the willingness of both people involved to contribute to the success. If you find yourself as the only person that is making the effort and striving to improve the relationship, then you may want to consider ending it — unless you are comfortable with being the person to “carry” the relationship alone. No one was born for a mediocre life. Just know that you always have the opportunity and the option to make every area of your life thrive and flourish, you just have to be willing to put the effort and time in to make it happen. A few tough questions to ask yourself at the end of each day are ‘Did I do my best in every task?’ and ‘Did I give my best self today?’. When you focus on the possibility of doing, giving and being your best self, you embrace the opportunity to be the best version of yourself and live an upgraded life, instead of a mediocre life. At the end of each day, as you reflect on these questions, you can identify areas that you can improve upon. Maybe it’s the effort and energy you put into a report that you presented to C-level executives at work or how you treated a co-worker that reports to you at work or your reaction to news a close friend shared with you. When you take time each day to reflect and find areas you can improve, you are able to make incremental changes to stepping into your personal power. On the drive home after leaving a workshop I hosted, I reviewed the conversations I had with audience members that came up to me after the main discussion. I asked myself the question ‘Did I do my best in every task?’ and I had to be honest with myself in that reflection time. I was in a conversation with a woman after my presentation and was hearing but not listening to her. I realized in my reflection that while she had been talking, I was running through a list of emails I needed to send that evening. I failed to practice mindfulness, to be present and fully focused in that conversation. Based on that observation about myself, I decided to do two things. First, once I arrived home, I sent her an email offering to meet for coffee, my treat, to chat with her and continue the conversation. Second, I made a promise to myself to be more present and engaged in every conversation from that day forward. When engaged in dialogue, I need to listen and hear what someone is saying, instead of running through a mental to-do list. That situation taught me to do things differently going forward, and I’ve been much more mindful in every conversation since that occurrence. Being alone is a beautiful thing. It’s an opportunity to relax and let go, without an audience. When you are alone, literally, in a room, you have the space of quiet and peace to do what you please with your time, energy and attention. Alone time is a wonderful gift to enjoy and embrace, savoring it to spend the time as you wish. When you are alone, metaphorically, you have the opportunity to explore who you are, discover your talents and hobbies and passions and interests, without the distraction or obligation of other people around. When live in a fast-paced, always-on world. Meetings, appointments, events and other time obligations often fill up your calendar very quickly. Having the chance to be alone allows you to enjoy the free time you have to focus on yourself so you can improve any areas that you want to improve or expand your mind by learning something new. When you take the time to get to know yourself and accept who you are, you live with self-love. A self-aware person is a confident person. When you enter a relationship with someone, knowing yourself and loving yourself, you can focus on leading with your strengths and the valuable things you bring to the table to contribute to others. Self-love and confidence help you to remain authentic in any relationship, so you can genuinely express who you are to others around you. When you are comfortable being and sharing who you truly are, your relationships with thrive because people crave to be around others that are real and authentic, instead of being superficial or fake. The best relationships are built on honesty and communication, and the only way to ever be honest in a relationship is to be honestly and authentically your best self. The best thing a person can do to understand and accept themselves is to take the time to explore and understand who they are. When you take time to get to know you, the person in the mirror, you can embrace and appreciate what makes you unique and talented. But first you have to know the intriguing and fascinating things about yourself in order to appreciate them. An inclusive society that accepts people who are authentic and real would create a beautiful world for us to live in. Instead of harshly imposing certain rules and standards, we can create a world with more creativity and flexibility for people to have the option to be authentic. As an example, there are several different learning styles, and perhaps having a school with various methods for teaching students (visual, auditory, kinesthetic, etc.) would result in the students having higher grades and more retained knowledge compared to a curriculum based on visual learning. There are things we can do to creatively re-create the standards in place of what is “right” or “acceptable” so that all people will realize that they matter, they are important, and they are accepted. First, I wake up each morning and spend time Gratitude Journaling. I write down in a journal everything I am grateful for. Second, every morning I say one positive power statement, also known as an affirmation. I look in the mirror and say something positive about myself and speak positivity about my day ahead. Third, any time I have a difficult task ahead of me, I give myself encouragement mentally by thinking about a recent time I was successful. For example, before giving a presentation to an audience of 500 people, I remind myself of a compliment I received from a recent presentation and how much it helped to inspire and improve that person. Fourth, I dress for success. Each day I put on an outfit that makes me feel good about myself. When I feel beautiful, I always have a good day. One of my favorite books about relationships is The 5 Love Languages by Gary Chapman. We all have a way that we want to be shown love and appreciation. And what’s so interesting is that we typically express love for others in the way that we want to receive love. The 5 Love Languages is a wonderful book that will teach you how to create love in a relationship that will last and be sustainable. You can apply what you learn from The 5 Love Languages to every relationship in your life, your family, your spouse, your friends and your co-workers can all benefit from the wisdom in The 5 Love Languages. The movement I would inspire would be to promote leading with kindness in every interaction. Anytime you say or do anything in life, let kindness and courtesy lead the way. Instead of starting a conversation with a complaint, start it with a compliment. Instead of driving fast and furious, cutting people off in traffic, let someone over in the lane in front of you. If we all focused our time, attention and energy on how to be kind to others, all day, every day, we would live in a much better world than the one we have right now. This quote is relevant to me because everything in life is about connection and relationships. The connection and relationship you have with yourself and everyone around influences your level of success. How you feel and how you make others feel is important. When you live each day by giving intention to how you feel and how you make others feel, you can carefully create a successful life for yourself, in any area, personally and professionally.